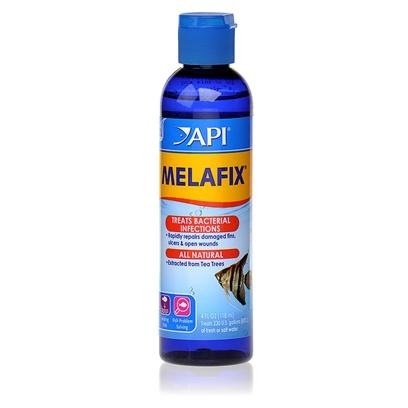 Aquaria AP MELAFIX 8 OZ - Rick's Pet Stores Inc.
Melafix is an all-natural medication derived from the leaves of "melaleuca," the scientific name for the tea tree. The healing properties of tea tree extract has been known for centuries. University studies and extensive laboratory tests showed that melafix is an effective bacterial remedy for freshwater and marine fish. It heals open wounds and abrasions, treats fin and tail rot, eye cloud, mouth fungus, and promotes regrowth of damaged fin rays and tissue. New growth can be seen in as little as four days of treatment. 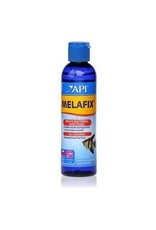 Melafix will not adversely affect your aquarium's biological filter, alter the pH, or discolor the water. Safe for live plants and reef aquariums.